Our worship service consists of hymns and many selections from Sovereign Grace Music, the Getty’s music and the like. We practice congregational singing with a keyboard and guitar. We do not have a worship band or a worship leader as we do not desire to have any focus on the performance of a band or any one person leading, but to keep our focus on the excellency of Christ and worship Him alone with our music. This article really hits it on the nail as far as our desire to use mostly hymns in our service. 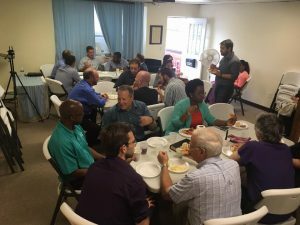 **We have a fellowship meal after our service that all are welcome. Each family is encouraged to bring a meal to share. 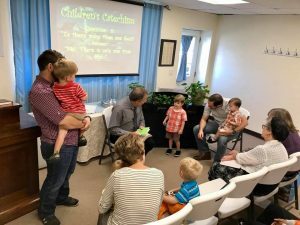 ***We do not practice age segregation within our fellowship and encourage all families to bring their children, regardless of age, to the meetings throughout the week. We are not a formal member of any Family Integrated Church groups, but agree in principle with the aspects of the movement as they pertain to Biblical involvement of families within the meetings of the Church and the family’s role in instructing their children in the Scriptures. 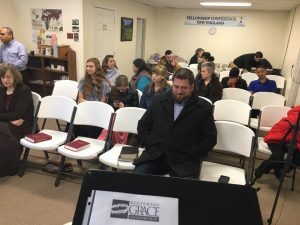 While this is a practice that stands in contrast to the main stream of Evangelicalism in America today, we trust that Biblically, and historically, the practice of the Churches of God throughout the world has been to involve and include children within the meetings of the Church. ***This statement was used from Sovereign Grace Community Church Website. We encourage everyone to give as God is directing them. The scriptures teach us that God loves a cheerful giver, so we desire folks to give as they are truly led by the Lord, cheerfully and never with any guilt or influence from anyone else. This is entirely between the individual and the Lord. There is no offering time during any of our weekly services, nor will there be appeals for money. There is an offering box where people are free to give an offering as they are directed by the Lord.